Whilst I can't profess to knowing much about male fashion; I do have a very stylish boyfriend who is educating me on the sartorial dos and don't for the heterosexual man. He has a very unique sense of style, dressing in the occasional bit of Urban Outfitters, American Apparel and Topman, cleverly avoiding looking like a Topman clone by combining these high street picks with charity shop and TK Maxx designer finds. If I had the budget, I would love to buy him a bit of designer though, although he probably wouldn't approve of my choices. 1. 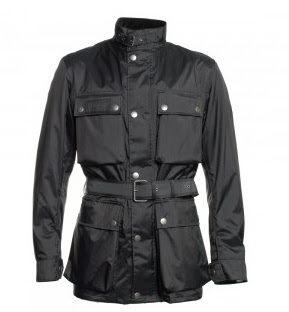 Belstaff Rally Master 350 Jacket in Perl Black, £350 available from Pockets.co.uk here. £350 may seem steep, but this Belstaff jacket is a design classic that will never go out of fashion. From a practical point of view it's also a jacket for men unafraid to brave the elements and go out in the worst of weathers; Belstaff make this jacket from their specialist hydrophillic nylon that combats even the hardiest storm conditions. 2. 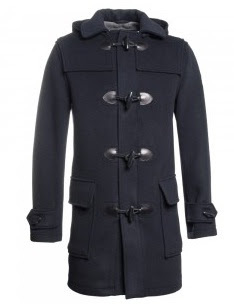 Hackett Classic British Duffle Coat, £485 available from Pockets.co.uk here. Pick number two is also a coat: I must have coats on the brain, but you can hardly blame me with the awful week of weather we're experiencing. This is a duffle coat however, and not the sort you see on trainspotters, but a fabulous Hackett Classic British Duffle Coat in a wool and cashmere blend. There's something frightfully British about the duffle coat, possibly because Paddington Bear became synonymous with the style. But the English Heritage look is now the height of style for chic gents, and the duffle nails the look in one. 3. Alastair Brogues, £290 available from church-footwear.com here. Finally, an item I'd love to gift to my boyfriend is a pair of brogues from the classic British brand, Churchs.Founded in 1873, this heritage brand produces the highest quality footwear; each pair of shoes takes a staggering eight weeks to manufacture. But the result is a fabulous, timeless pair of brogues that will last decades.